Unfortunately I woke up thinking it was Sunday... imagine my disappointment when I actually had to get up for work. At least ya'll are here to cheer me up!! Did you have the best weekend ever jam-packed with super fun activities? My weekend flew by so fast while I was at my parent's house in Wichita. The fun weekends always do, don't they? Well luckily I am only working through Wednesday, and then I'm off for an amazing lake trip with Adam and my fam! This girl desperately needs to take some time off (...and have it be for a fun vacay and not a jillion weddings for once!). So let's get this week started right, shall we? Hope you gorgeous gals are having a great day already! Hi! First I stopped by Going the Distance where she talked about her last 'free' weekend before school started. Looks like she had fun going golfing! Then I went to the Sweet Life where she wrote about her road trip she's currently on. Looks like tons of fun and she also has an adorable puppy along for the ride! As for my next DIY project... hmmm... I need to finish my senior year scrapbook that contains my last year of college and all the wedding planning. Does that count? stopping by and hopping after a long break.. I stopped and checked out the newest blogs. Young girls on a road trip (ahh, to be young again and not road trip in a mini van with two screaming kids) Driving ranges and Medieval Times....makes me wish I were young(er) again. Have a great Monday. DIY project...buy and paint 4 adirondack chairs....by next Saturday!! I started at Learning Patience, and got an amazing idea for a meal which is going to help with pregnancy cravings! It looks so good! Then I went to Cr8ve Journal, which has some incredible artwork. It reminded me that I haven't been very creative lately, and need to get some color on a page. My next DIY project is pulling together a baby nursery BEFORE I have this baby. I have under 5 weeks left...counting down! Happy Monday Meg! My latest DIY are gallery walls. I'm trying to put together two of them! I visited This is Something Infinitely Interesting and she shared a preview to the movie, The Vow. I hadn't seen it yet and oh goodness, I had tears. It's going to be so good! I also visited The Sweet Life and she shared about a road trip. After my 27 hour drive to our new home, I'm glad for no road trips for a while! Sorry you woke up thinking it was Sunday, I have done that already and it really is kinda awful! Thanks for this great hop, I am enjoying all the blogs and finding new blogs! 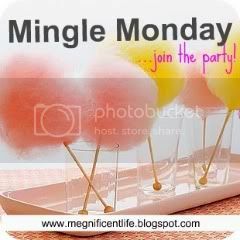 I am new to this mingle! I really love This is Something Infinetely Interesting! Her videos were great but I love the photos in her post on coffee expecially the owl!!! She has a very cute blog and I am now following her! I also popped into see The Sweet Life and really enjoying reading about the road trip. I think that blogs that have great photos along with stories are very effective! Loved the puppy!! Whoops! Forgot the DIY question! Since I design my own jewelry, I am always making jewelry. But I have found a few cute DIY projects on Pinterest that I might take a break and try!! Some are very simple such as taking a glass container and glueing twigs up the sides and then putting a candle or candies inside! Shutters painted and picture hangers attached with wire then use on a wall and place favorite cards or picture in the vents. I am thinking of doing that and antiquing the wooden shutter! I consider all my new recipe experiments DIY projects! I visited Learning Patience and she had a yummy-looking stuffing recipe on her site. Mmmm! I might just have to try! I also visited The Sweet Life. She is on a road trip right now and passed through the state that I live in! We also share a mutual excitement for the Bachelorette finale tonight! Going the Distance: and her weekend looked so fun! Adventures in Amber-Land: She saw Gavin DeGraw in concert and met him. What great pictures! A Nest for All Seasons - she's followed my blog for ages and is one of my favorite commenters, so now I'm excited to finally follow her back. She's so creative, I can't wait to see what her little boy's room looks like for the big reveal tomorrow. On the Front Porch: She explains why she picked the great name for her blog. A Buckeye in Badgerland: She found some cute things on Pinterest! Love Lucy Locket: She had a picture collage of what she's been up to recently. It included a super cute blue suitcase and Nutella swirls (think cinnamon roll)- yum! I just covered my dining room chairs and that's actually what today's post is about! Next up...a Menu/meal planner framed to hang in my kitchen to help me organize weekly meals. My next DIY project is to make a world map so I can pin all the places I've been in the world! I visited Adventures in Amber-land and This is Something Infinitely Interesting...2 great new reads for me! Amber met Adam Levine this weekend which is super awesome! And Lisa posts great music videos! This week I visited Going the Distance. The kids at her school are back in session already! I stopped by On The Front Porch. I love her layout and I love how she told us how she got the name for her bloggity blog! I also stopped by This Is Something Infinitely Interesting! She has a great August planned with all kinds of goals! I can't wait to check in and see how she's doing! I Dream Loudly! Loved her post on her preggo pics! A litte bit of Everything! She did a post on donating her wedding dress! Alright so at Laugh Until Your Cheeks Hurt there are some awesome summer tunes. It reminded me to add a few of the old ones to my ipod! Also Lisa at This is Something Infinitely Interesting reposted a video of this boy with AMAZING TALENT!